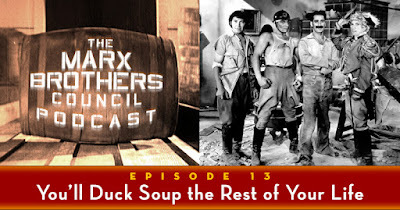 The Marx Brothers Council Podcast: Is There Going to Be a Podcast, Or What? Is There Going to Be a Podcast, Or What? 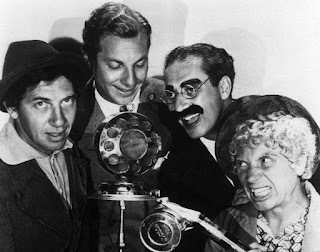 For podcast information, a more specific sense of when to expect the premiere, contests through which listeners can win Marx books and other fabulous prizes, and requests for requests (guests, topics, and so on, especially so on), keep an eye on this blog, as well as on the Marx Brothers Council Facebook group. We would suggest keeping this site open on your device, and setting an alarm to remind yourself to refresh the page every thirty seconds. Thanks for your patience -- we look forward to unveiling the first, introductory episode soon, so you can finally find out whether we prefer Animal Crackers or Go West! I haven't heard anything yet. Well that's why we didn't say anything. Well that's why I didn't hear anything. At this one post a month schedule I don't how you expect us, the riff raff, to be able to keep up. Fortunately, there's nothing to listen to, which gives us time to see a man about a horse, with or without feathers. All of that will be addressed in next month's post.